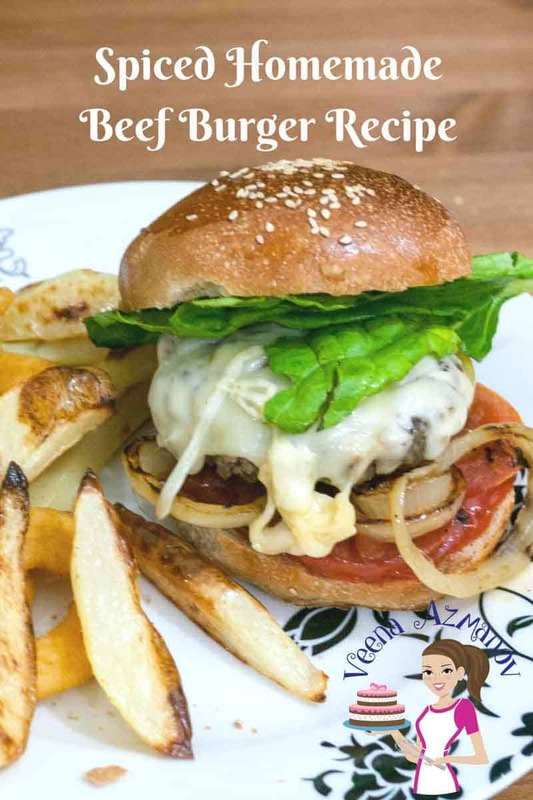 A good homemade burger should be simple, easy and less complicated. This spiced homemade beef burger is just that! 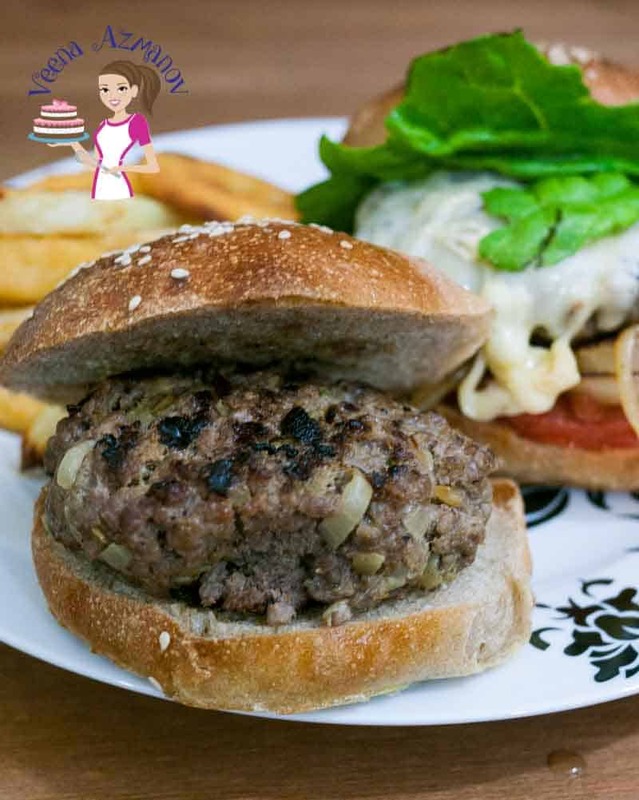 The spices add a fun twist to the regular burger and serving it over my soft whole wheat burger buns makes it more nutritious and hearty. Have you started with BBQs this summer already? Oh, we have! It’s a ritual here, almost every two weeks, the family wants to get together and the only cooking happening is BBQ -of course burgers and steaks mostly. While a good meat needs nothing more than just salt and pepper for flavoring, you can’t deny the extra kick you get from a few spices – can you? These burgers are an absolute hit. Some smoky spices, some sauteed onions for sweetness and a hot grill! 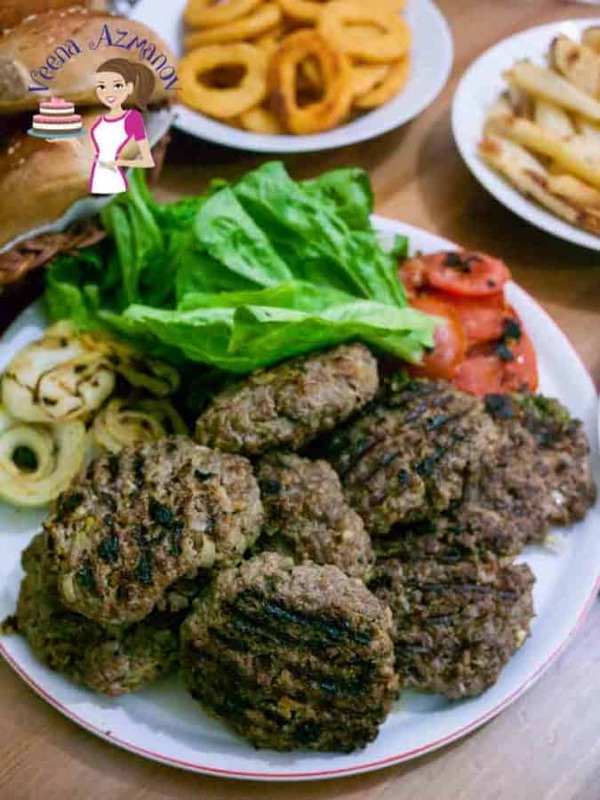 Beef – The best meat for juicy burgers are the tender but full-fat meats. If you choose one with less fat they tend to shrink and become dry. Also, one of the many reasons why people choose to stuff burgers so the center won’t need cooking. It is always a good thing to have a butcher whose knowledge you can trust. He usually will give you the best he has on hand for that day. Another important point to remember is to ask for coarse ground meat, not finely ground. The fine ground will tend to dry out faster. Onions – I love using a mix of red and white onions -to add more depth of flavor. While the brown onion has a zing; the red is sweet. We are big onion fans in our home even my kids. So I grill extra red onions and add them onto our burgers. Yeah, I know!! Sauces – These are definitely optional and things you can omit or replace. Try adding a bit of ketchup or some mayonnaise as well. Cheese -Again I love the nutty flavor that Parmesan has and often I will add it to dishes that aren’t really Italian. Avoid handling the meat too much. The more you handle the meat the tougher it gets resulting in dense chewy burgers. Notice below I mix all ingredients first then and the ground meat and mix gently to combine. This makes soft juicy burgers that melt in the mouth. 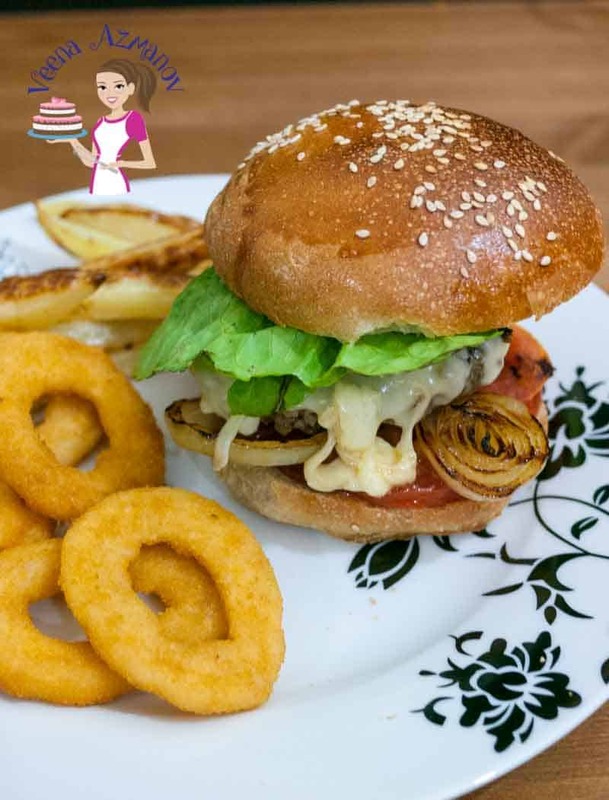 When cooking burgers – Leave them alone!! NEVER press down with a spatula as you will push the juices out making the burger dense. Is it time to flip yet? – You need to flip the burger just once actually. Place the burger on the grill or pan, wait till it done on one side. If you try to lift and it’s still stuck means it’s not ready yet. Wait if you force it all the beautiful caramelization you just got on the meat with the high heat will stay stuck to the pan! 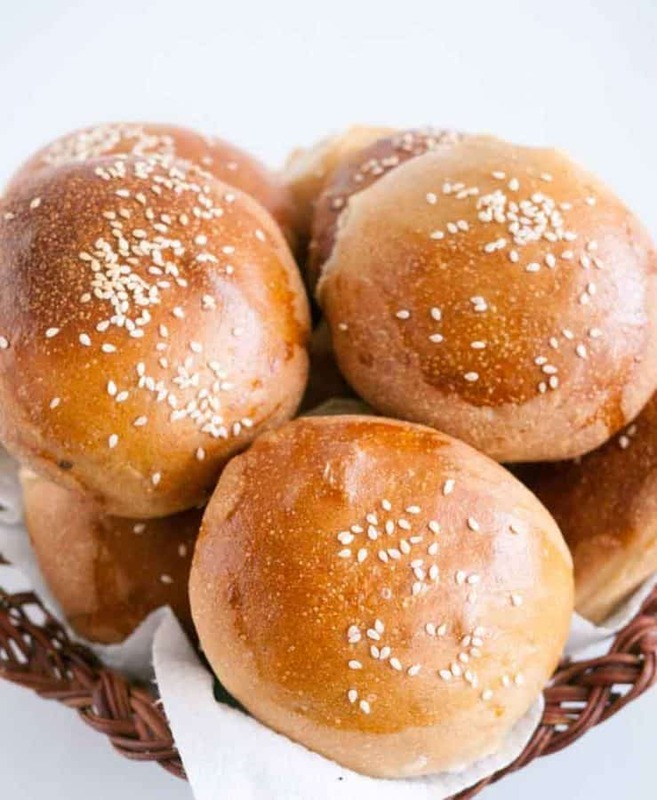 Well, with the whopping success of my super Soft Burger Buns which are by far the most popular on this blog. I’m pleased to say that I do have also succeeded in making a super soft whole wheat burger buns. I will be sharing that recipe with you shortly. Saute chopped onions in a pan until translucent or grill then chop fine. Have all ingredients ready to go. 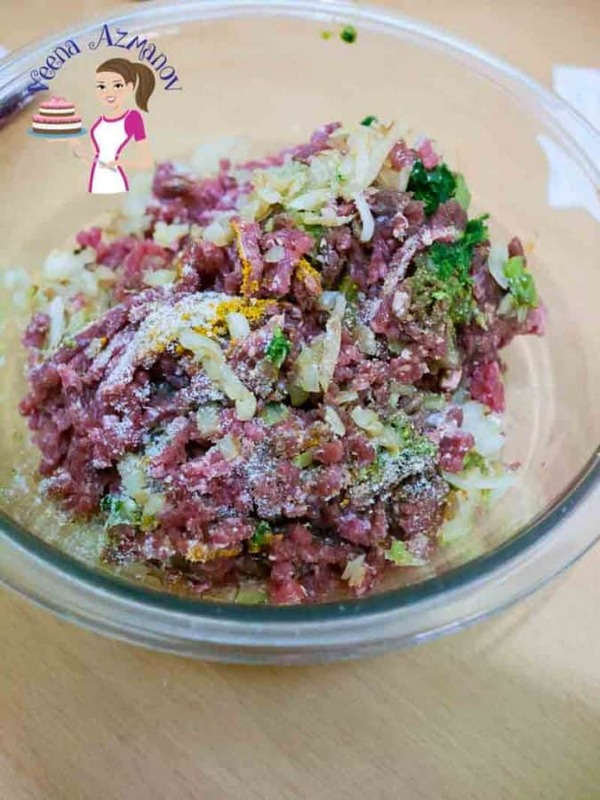 Place all the ingredients in the bowl – sauteed onion, garlic, ginger, mustard, herbs, sauces, juices, and Parmesan juice. Mix to combine. Season with salt and pepper. Divide your mixture into four and form a disc – approx 12 cm (not too thick or thin). Just press lightly into a ball then flatten with the fingers. You can keep these wrapped with Cling wrap in the fridge until you are ready to grill them. Thaw burgers to room temperature an hour before grilling. Heat the grill on medium high. 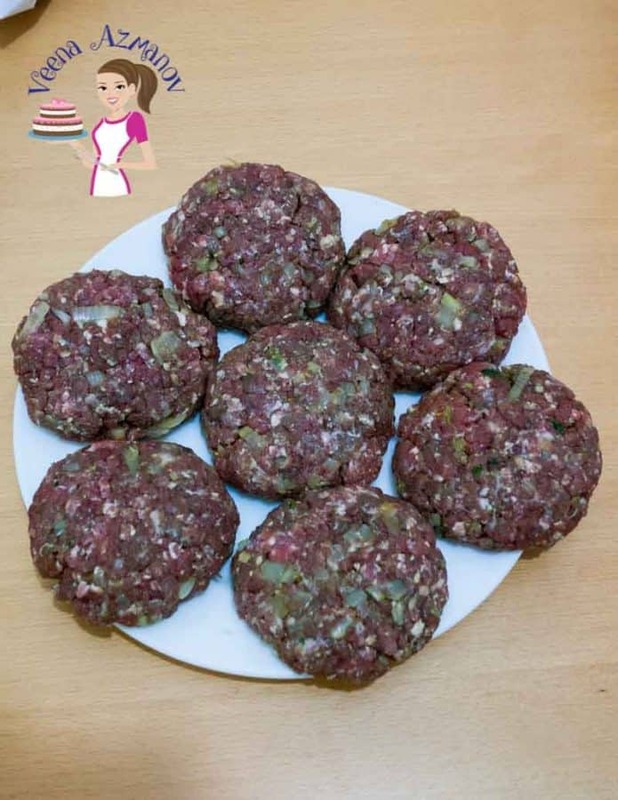 Place burger – let cook without touching – you will see the sides changing color from the bottom up. Medium – about 3 minutes on each side. Medium rare – about 2 1/2 to 3 minutes on each side. For the last one minute – add the sliced cheese. Place a grill or fry pan on medium high. Once hot – place the burgers and let cook for at least 2 to 3 minutes before you touch them. When grilled on one side – you will see the side changing color from the bottom up. Flip and cook on the other side for two more minutes. For the last one minute place the cheese slices on top and. Remove from the pan. The heat in the burger will melt the cheese further. Spit the burger buns and heat them on the same hot pan. 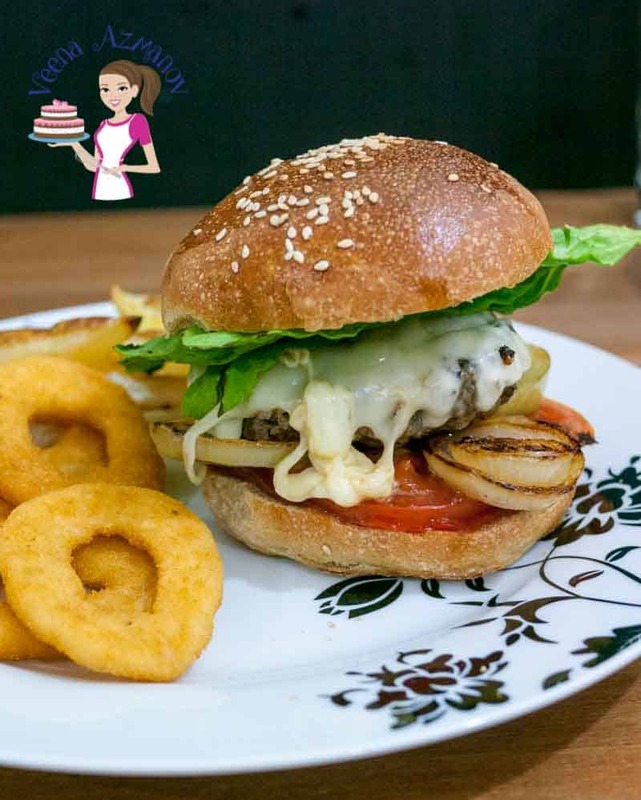 Serve burger with your choice of sides. We love our onion rings and Oven Baked Potato Wedges or Oven-Fried Potato Chips. Place all the ingredients in the bowl - sauteed onion, garlic, ginger, mustard, herbs, sauces, juices, and Parmesan juice. Divide your mixture into four and form a disc - approx 12 cm (not too thick or thin). Heat the grill on medium-high. 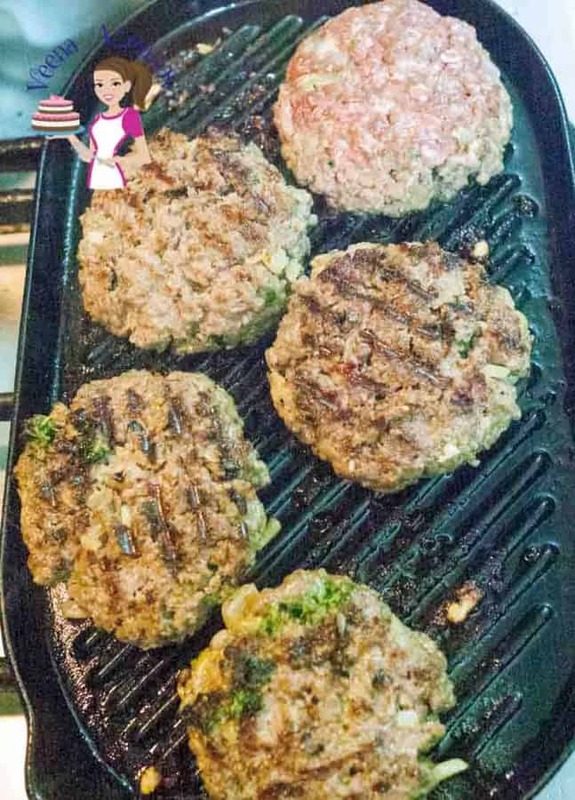 Place burger - let cook without touching - you will see the sides changing color from the bottom up. For medium well - cook about 4 minutes on the first side then 3 on the next. Medium - about 3 minutes on each side. Medium rare - about 2 1/2 to 3 minutes on each side. Rare - about 2 minutes should do. For the last one minute - add the sliced cheese. Place a grill or fry pan on medium-high. Once hot - place the burgers and let cook for at least 2 to 3 minutes before you touch them. When grilled on one side - you will see the side changing color from the bottom up. Now that’s a summer feast all ready to enjoy! Made this last week and it was DELICIOUS!! The flavors are spot on. Thank you, Tania. I am so happy that you enjoyed this recipe. Thanks for coming back to write this feedback. Thank you, Tanisha. So happy to hear you had success with this recipe and that you enjoyed it. Thank you for coming back to write this feedback. Have a wonderful weekend. We love our hamburgers — so good and I noticed you had grilled onions on the burger. YUM!! All that melting cheese looks so good. 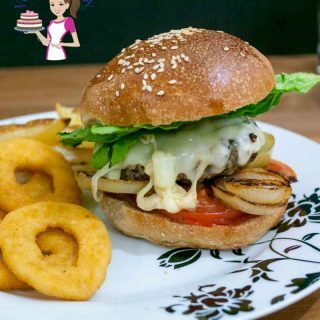 There is really nothing like a homemade burger WITH a homemade bun. Lordy, but my mouth is watering just thinking about it. And with the burger? Your seasonings and sides are right on. We’ll have to make this our last hurrah to summer and grilling. You said it Marisa. Nothing better than homemade burgers. I love grilled onions!! My absolute favorite. I have to have them on my burgers. The homemade buns are such a treat !! Yeah I love my spices lol!! Thanks Marisa. Homemade burgers are the best. With our summer coming to an end in the next several weeks, I will miss the BBQ. We do have an indoor grill, but love the flavour the BBQ brings. These look big, juicy and delicious. Fries and onion rings are a must too! !